In October 2001 two articles appeared on the web which provided the first clues to what really happened. One was Carol Valentine’s “Operation 911: NO SUICIDE PILOTS”. This article drew attention to the possibility of remote control of a large jet aircraft. That this technology exists is public knowledge. It was developed by Northrop Grumman for use in Global Hawk, an automated American military jet with the wingspan of a Boeing 737. (For further details about Global Hawk see Operation 911: NO SUICIDE PILOTS.) 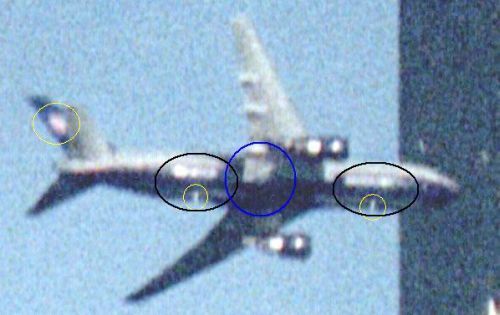 Since it is possible to control a Boeing 757 or 767 by means of remote control, might not the jets which hit the Twin Towers and the Pentagon (assuming that more than one did) have been remotely controlled? In which case there would be no need to maintain the improbable hypothesis that the four jets were simultaneously hijacked by nineteen on-board Arab terrorists. The other article discussing the possibility of remote control of Boeing aircraft was Joe Vialls’ “Home Run: Electronically Hijacking the World Trade Center Attack Aircraft”. But there’s a problem with this theory: Although the technology for the remote control of a Boeing jetliner certainly exists, and could be installed (if it is not already standard) on four Boeings, getting all four remotely controllable planes to take off within an hour of each other would not be easy, and would require more people with insider knowledge than is advisable (the more people involved the more chance there is of a mistake, or of information being leaked). Not only would United Airlines and American Airlines personnel be needed to coordinate the plane assignments but also four different teams of remote controllers would be necessary, one for each remotely hijacked plane. to blame these attacks on “Arab terrorists” and to use this as a pretext to launch military campaigns against “enemies of America” in the Middle East and in Asia, the real aim being to get control of their oil and mineral resources. Sometime during the late 90s the U.S. state security agencies realized that certain foreign terrorists were thinking of hijacking planes and crashing them into significant buildings (naturally the Twin Towers would come first to mind). They might even have recruited these would-be terrorists. In any case, they helped them along (covertly, of course), providing money (transmitted via Pakistani ISI operatives), U.S. visas, introductions to U.S. flying schools and useful tips. The plan was not for these would-be terrorists to do the job (since their predecessors had demonstrated their limitations by botching the 1993 attack on the WTC) but rather to be “useful idiots” who could plausibly be blamed (just as Timothy McVeigh was the “useful idiot” blamed for the Oklahoma City bombing). The actual operation was far more elaborate than the would-be hijackers were capable of carrying out, and required equipment which they did not have and prior access to the Twin Towers which was not possible for them. A military jet either loaded with high explosives or carrying missiles or both. A Boeing 767, painted up to look like a United Airlines jet (call this “Pseudo Flight 175”). In the alternative theory the F-16 is replaced by an AGM-86C cruise missile capable of being fired from a B-52 and of flying to its target under GPS-guidance, and able upon impact to generate heat of over 2,000°C. Early on the morning of September 11th Mohammad Atta and some other Arabs board American Airlines and United Airlines planes under instructions from their CIA or FBI handlers. Atta and others, some recorded by airport security cameras, will later be declared to be “the hijackers”. A half-hour or so after taking off the pilots of the four civilian airliners are informed by radio that the U.S. is under attack by terrorists and that they are to shut down their transponders and land their planes at a military base in some north-eastern U.S. state (directions to the base are given). Pseudo Flight 175 changes course toward New York. 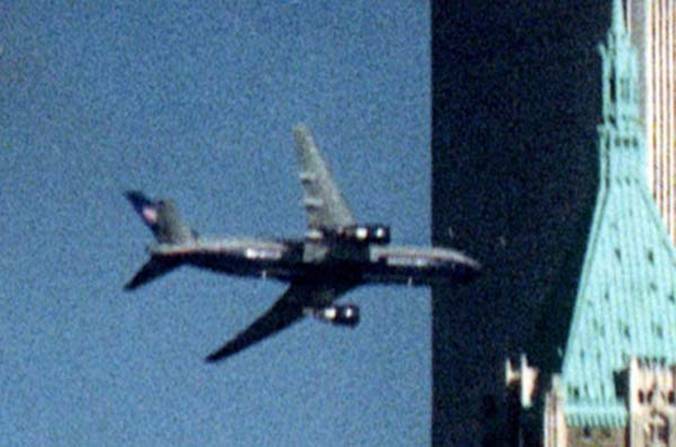 To radar operators it appears as if UA Flight 175 is now flying toward Manhattan. The passengers on UA Flight 93 are led to believe that the plane has been hijacked, and are instructed to use their cell phones to tell this to their relatives (thus planting fake evidence which will later be used to support the official story). George W. Bush announces to the nation that he has made some phone calls and then goes into hiding for eight hours. He fails to order defensive action by ordering U.S. Air Force jets from bases near Washington to scramble to intercept the other two (allegedly hijacked) planes still in the air. No other Air Force officer orders jets to intercept the planes. Interceptors are finally scrambled an hour after the first of the commercial jets has gone off course and 45 minutes after the impact at the North Tower. The F-16 jet fighter (see 1. above), under remote control, flies at high speed toward Washington D.C. (perhaps after crossing the flight path of AA Flight 77), descends to near ground level, makes a horizontal approach to the Pentagon, fires a missile which produces a huge explosion at the outer wall of the Pentagon, then itself crashes into the building (at 9:38 a.m.), its engine penetrating several rings of the Pentagon. In the alternative theory it is an AGM-86C cruise missile which strikes the Pentagon. It crossed several of the building rings of the Pentagon, creating in each wall it pierced a progressively bigger hole. … When traversing the first ring of the Pentagon, the object set off a fire, as gigantic as it was sudden. — Who was Behind the September 11th Attacks? Meanwhile (by sometime between 9:15 a.m. and 9:45 a.m.) all four AA and UA jets have landed at the military base to which they were directed. The 199 (later listed) passengers and crew from AA Flight 77, AA Flight 11 and UA Flight 175 are herded onto UA Flight 93, where they join the 33 (later listed) passengers and crew, for a total of 232 people. Explosives are loaded on board. The South Tower collapses (at 9:59 a.m.) in a controlled demolition, 56 minutes after impact. Sometime around 10:00 or 10:15 a.m. UA Flight 93 takes off from the military base (either under remote control or under the control of a military pilot unaware of his fate) and flies toward Washington in a fake “terrorist attack”. The North Tower collapses (at 10:29 a.m.) also in a controlled demolition, 1 hour and 44 minutes after impact. All passengers and crew from all four “hijacked” planes, perhaps or perhaps not including those 34 (later unlisted) passengers (including Mohammad Atta) who are part of the operation, are in this way eliminated. The outer wall of the impact site at the Pentagon is caused to collapse (so that the small size of the hole in the wall caused by the impacting object would no longer be visible). Around midday the media whores begin to disseminate the story that this “terrorist attack” was masterminded by Usama bin Laden. Around 5 p.m.the building known as WTC 7 collapses in a controlled demolition. Misled by the mainstream media a shocked and outraged American public demands revenge against the perpetrators, whom they assume to be Arab Muslim fundamentalists. George W. Bush announces his “War on Terrorism” and the Pentagon swings into action to implement its previously-prepared plans to bomb Afghanistan (into submission to U.S. oil interests). 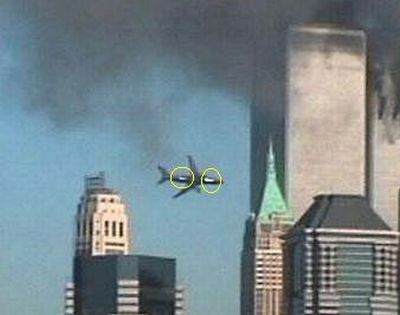 Of course, some of the details of this account may turn out to be wrong, but overall it appears to be the most likely explanation of the events of September 11th and (in contrast to the official story) is consistent with all the evidence and is contradicted by none. Only a full and impartial investigation of what happened on September 11th will reveal the truth, but the Bush administration (fearing the consequences when the American people find out what actually happened and who was behind it) has done everything it can to prevent such an inquiry from taking place. As in the Valentine-Plissken hypothesis, all innocent passengers on board flights UA 175, AA 11 and AA 77 were placed on board Flight UA 93, which was then shot down by a U.S. Air Force A-10 Thunderbolt (shown at right) over Pennsylvania. The other three planes ended up in pieces at the bottom of the Atlantic ocean. Under the Operation Pearl scenario, the most likely perpetrator would be Mossad, Israel’s spy agency. An arm’s-length relationship with the Bush administration, with neocon elements acting as go-betweens, would enable Rumsfeld, Bush, and other members of the US administration to disclaim any “specific” knowledge of a forthcoming attack. It is unlikely that Operation Pearl could be carried out entirely by Israeli operatives without support from within the U.S. Air Force and the state security and intelligence agencies. The CIA has always maintained as a matter of historical record that it has never murdered an American citizen on American soil. If, as a result of Eric Olson’s persistence in trying to uncover what really happened to his father [Dr Frank Olson, a U.S. Army scientist], and the investigating skills of public prosecutor Saracco, this turns out to be a lie, it could well be the beginning of the end of the Agency. Similarly if the CIA can be shown to have been involved in the murder of the 200 or so passengers (most of them American citizens) on the four Boeing jets, who died when UA Flight 93 exploded in the sky over Pennsylvania, then the Agency will be finished (and none too soon either). On the side the plotters purchased put options for companies whose stocks were sure to be adversely affected by these events, such as the parent companies of the airlines whose planes are believed to have been hijacked. Their intention was to make a killing, so to speak, by purchasing the right to sell stocks in these companies at a price which they knew would be considerably higher than the price they could buy them at on the open market (after the September 11th attack had driven the prices down). Despite an SEC investigation, the identity of those who purchased these put options has so far not been revealed.